Computer Refuses to boot. LED POST Message goes straight to FF immediately and wont budge from there. I have completely unplugged all HD cables unplugged and replugged the Video Card (the only expansion card on the system right now) Taken out the RAM and in all scenarios it just stays on FF. 1. There was a power outage in my house the day it started doing this. 2. The Northbridge fan does not start. Uh-oh. It's not the power outage that gets you. If your power strip is on the same circuit as your refrigerator, it's in danger, because the refrigerator's pump can draw huge amperage for an instant when the power is restored. For this reason, it's best to set "don't start automatically after losing power" into your BIOS. Your problem may be entirely different--I hope so. I am pretty sure its already set to not start after a power outage. At least it never has started before when the power has went out. I also dont think the fridge is on the same circuit although there is a fish tank with all the various pumps and filters. FF - This code can be life or death for your motherboard, literally. FF means a successful boot or a complete failure. This normally means that your bios chip is dead or not being accessed properly. Try tapping or holding insert while attempting to boot the system, resetting the cmos, or: If your floppy drive makes any noise when booting, but the system appears dead, try placing a floppy in the drive with a copy of the latest bios file on it. This might cause the system to use an emergency re-flash feature. Is the above info accurate? I havent actually tried any of the steps advised except for resetting the CMOS. How would I boot from a BIOS on the floppy? I have never even heard of that. A hard shutdown can wipe the BIOS chip. Not kill it but wipe the data. This happened once on my DFI board. Would that result in the symptoms I am seeing? FF on LED's and Northbridge not starting? and well. the not booting part of course. I also posted this same thread in the Epox Motherboards thread, I figure this is actually the more appropriate forum for the question but I didnt notice this forum till after I had posted over there. Not too sure about the FF. My board would act like it was going to POST and nothing would happen. Sent it back for a flash and all is well..
Thats kinda what mine is doing. It acts like its going to post, all the lights light up, the CD LED lights up. The CPU and Video card fans both start spinning. then it just sticks there, going no farther. The northbridge fan not starting kinda worries me. Also I am now uncertain that I am resetting the CMOS correctly, all I did was change the jumper and then change it back, but I read somewhere that I shoudl also remove the battery? In normal circumstances you shouldn't have to remove the battery. Switching the jumper to the clear cmos state for 10 seconds should do the trick. Though sometimes when the bios chip is being dodgy some success has been achieved by removing the battery for a night. Then try again in the morning. Does your keyboard light up when you switch on the PSU after several seconds of being powered down? Are there other electrical or electronical devices behaving oddly? Assuming your board hasn't been damaged here's what I would try. You could try the battery thing mentioned above. But I would first try to find more possible fail causes which are easier distinguisable. Check your PSU. A PSU which has failed in a certain way can also cause power failures because of overcurrent. But that could also toast your board completely. However a failed PSU is still very much possible. I've had cheap PSU's fail on me because of power outages. It is possible that certain components don't get the juice they need but a fan is less likely to be in that scenario unless there's a voltage rail missing. If you have a graphics card that doesn't draw much juice insert that one. A PCI one would do just fine. If nothing works attempt to replace as much components you can for testing purposes. Memory, graphics card and CPU. Use one stick of memory, preferably one of low size and place it in the socket the nearest to the CPU. Remove the heatsink and CPU, inspect both and reseat them both. Maybe order yourself a spare bios chip. I know mine has come in handy several times. Good luck, I hope your board hasn't been damaged. I'm not sure you'll be able to get an 8RDA6+Pro back from RMA as it has been discontinued. You say the post code goes directly to FF without showing any other post codes along the way? Not good sounds like trouble. Just for drill try another psu if it's still the same then it's toast. I just rma'd this board last week it would cycle through all the codes after a replacement psu was installed but the PCI-E slots were dead. No display at all even though the vid card was ok.
Last edited by learners permit; 15th October, 2006 at 05:21 AM. What do your caps look like, any sign of leakage? An 8RDA6+Pro is a too recent board to be in trouble because of bad caps. That whole ordeal was pretty much passed by the time these boards and chipset came out. However don't exclude that possibility Rayston. Reseated EVERYTHING including the CPU and now the problem has changed for the worse, now it powers on for only a second (FF Post Code) and then powers back off, and it only does that after pressing the power button a bunch of times. I did notice something that looks like..leakage or burn marks or something, I am not sure. Theres actually 2 spots, 1 is right below the AGP slot, the other by one of the PCI slots. Is this bored unsaveable? Do I need to maybe take it to a computer repairman? Last edited by Rayston; 16th January, 2007 at 12:53 AM. I'm sorry to say that that looks like it is beyond saving. Do I need to maybe take it to a computer repairman? You could have a go at rebuilding it yourself with a new board if yours is dead? Not hard to put something together. That is assuming no other parts were cause/effect of this problem. Though Im sure others can advise more here than I can. Chances are that even if you could replace those components there would more damage that you cant see to repair. I don't directly see any damaged components there. Try to clean it off somewhat. The substance on your board does look like battery fluid or capcitor fluid. 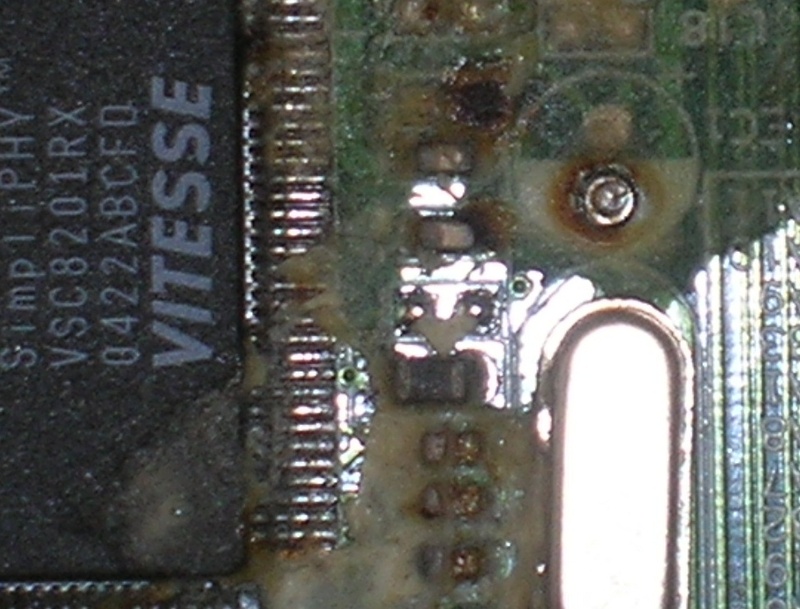 And some corrosion has also formed. It looks bad indeed.